Harry Frankfurt, an American philosopher who has taught at Princeton Yale and Rockefeller Universities, explores in his lectures the idea that what one loves reflects what he or she values and their own self conception. Frankfurt believes that what we love and care about is a part of our psychic raw material and cannot be changed without intense personal examination. The psychic raw material is made of the desires, or goals, that help shape an individual. 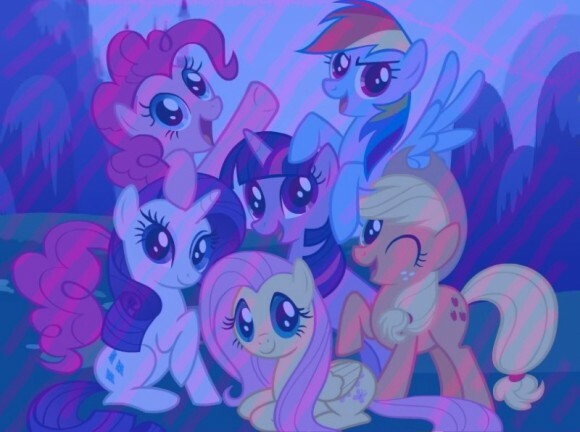 In My Little Pony: Friendship is Magic, when ponies discover a special talent within themselves, a symbol representing their discovery appears on their back, upper left leg. It is called a cutie mark and is a literal manifestation of one aspect of their psychic raw material that shows what they care about and their special talent. Cheerilee, the school teacher in Ponyville, explains in “Call of the Cutie” that “discovering what makes you unique isn’t something that happens overnight, and no amount of hoping, wishing, or begging, would make a cutie mark appear before its time.” Younger ponies without cutie marks are called blank flanks, and a few of them make up a group called the Cutie Mark Crusaders whose mission is to seek out their true purpose in life and earn their cutie marks. The psychic raw material is present from the beginning of one’s life, according to Frankfurt. In, My Little Pony: Friendship is Magic, this idea is shown through the back story of the character Pinkie Pie. Pinkie Pie grew up on a bleak, depressing rock farm, but soon she discovered colors and celebration. She threw a party for her parents and family members, and finally saw them smile for the first time. Seeing people happy is important to Pinkie Pie, and that is why, by throwing the party to make people happy, she received her cutie mark- a picture of three colorful balloons. She was able to recognize and reflect on what laughter meant to her, and that altered her life. She enjoyed seeing loved ones smiling and laughing before she even recognized what “fun” was. An episode that concurs with Frankfurt’s belief that psychic raw material is ingrained in one’s essence is “Magical Mystery Cure,” when several characters’ cutie marks are switched by magic. The affected characters sing, “It’s got to be my destiny, and it’s what my cutie mark is telling me,” as they are miserably attempting to perform the other pony’s functions. Just because the outer representation of their psychic raw material and their resulting function in society changes, does not mean their inner priorities change. Their conception of self was fractured, but not destroyed. For example, Rarity is the fashion-designing-pony, but her cutie mark was switched with the mark of Rainbow Dash, the weather-creating-pony. As Rarity tries to control the weather, she unknowingly creates a fashionable checkerboard print with the clouds in the sky. Fashion is what she cares about, what she loves, and even though her cutie mark was changed, her love shines through. What makes humans, or magical cartoon ponies, individuals who care and love is ingrained inside of us, and no matter what external forces try to do, the psychic raw material will not change. We humans do not get a psychical representation, but the fulfillment is just the same. Alexandra Agostinelli is currently an undergraduate student at SUNY Buffalo State College. She is studying Political Science and Sociology, and enjoys combining the two subjects to help understand the world. Her project about the My Little Pony franchise and political antagonist attitudes is the result of these combining interests and will continue to be worked upon and studied. Her educational past includes an Associate of Arts degree from Monroe Community College. Frankfurt, Harry. “Taking Ourselves Seriously and Getting it Right.” Stanford University. 14-16 April, 2004. Lecture. “Call of the Cutie.” My Little Pony: Friendship is Magic. The Hub. 07 Jan, 2011. Television. “Magical Mystery Cure.” My Little Pony: Friendship is Magic. The Hub. 16 Feb, 2013. Television. “The Cutie Pox.” My Little Pony: Friendship is Magic. The Hub. 12 Nov, 2011. Television.